Run, jump and slash as a ninja! 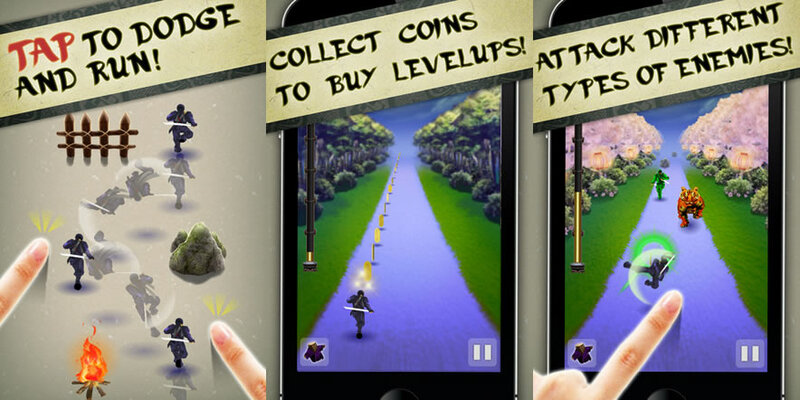 An action game TAP NINJA" released "
Run, jump and slash as a ninja! Kayac Inc. (head office: Kamakura-shi, Kanagawa; CEO: Daisuke Yanasawa; “Kayac”) has released TAP NINJA, a running action game, on the App Store. Tap the screen to control the ninja running through the night. Defeat your foes and avoid obstacles as you aim to get a high score based on the distance run and the coins you get. ■ Defeat foes, avoid obstacles, and outrun everyone else! The ninja’s path is blocked by foes, beasts, fire and boulders. Tap the screen to slice foes, leap over obstacles and pick up fallen coins as you run into the distance. ■ Use the coins you pick up to increase your skills and get new items! By picking up coins in the ninja’s path and making purchases in the store, you can increase your skills such as attacking range of your sword. You can also get items such as “Boost Dash” to cover a lot of distance at once. ■ Get high scores to clear missions! The missions available in the game can be cleared by getting high score or collecting coins. Aim to attain the highest rank of a 5-star ninja.